JCM has been supporting the communications for the OECD Rural Development Conference which was held in Edinburgh 9-12 April 2018. This is the press release to accompany the Edinburgh Policy Statement issued after the conference. Rural areas are vital to national economies and addressing global challenges, according to the policy statement released at the 11th OECD Rural Development Conference held in Edinburgh this week. The policy statement, which provides guidance to governments to support rural economic development, also declared that innovation will be critical to the future competitiveness and sustainability of rural economies. “Rural regions are not synonymous with decline or agricultural specialisation, but places of growth, opportunity and inspiration, yet rural is still not central to government policy. Rural areas have a key part to play in some of our major global challenges. They are best placed to develop new energy sources, to help sustain our natural environment and to ensure food security. 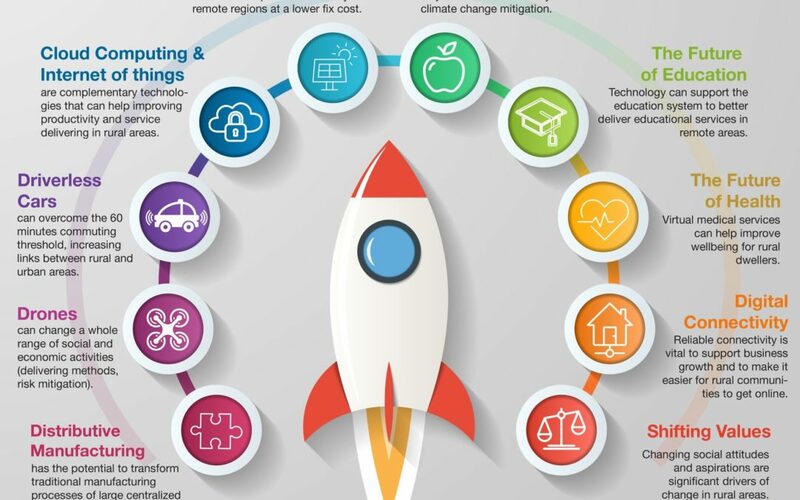 The policy statement identifies 10 key drivers of change predicted to influence the future of rural economies and communities and their potential to prosper, including additive manufacturing (for example 3D printing); decentralised energy systems; digital connectivity; the future of health; shifting values and preferences; drones; and driverless cars. The statement also recommends that, in addition to prioritising rural innovation, a robust rural policy should place social, environmental and economic wellbeing at the forefront of policy decisions and take an integrated view across policy sectors to avoid one policy detracting from another. The 2018 Conference, Enhancing Rural Innovation, was hosted by the Scottish Government and co-hosted by the European Commission and the UK, to provide a forum for key policy officials and academics from OECD member countries to engage and share ideas and experiences on rural policy. It is the eleventh in the OECD Rural Conference Series, which has been held all over the world since its inception in 2002. Prior to the main conference, a series of interactive sessions, led by the European Network for Rural Development, showcased exemplary projects and approaches already launched by rural communities to embrace 21st century challenges and opportunities. Following the conference, there were visits to leading Scottish rural businesses, illustrating the power of technology, robotics, business development and deconcentrated energy systems, and showcasing Scotland’s leadership in rural development. The full policy statement can be found here. The 10 megatrends driving change can be found here. The 11th OECD Rural Development Conference was held at the EICC in Edinburgh 9-12 April 2018. It was hosted by the Scottish Government in close cooperation with Scottish Enterprise and Highlands & Islands Enterprise, and co-hosted by the European Commission and the UK. The European Network for Rural Development led the delivery of the series of preconference workshops. The OECD Rural Development Conference is part of a series led by the OECD’s Working Party on Rural Policy of the Regional Development Policy Committee, served by the Centre of Entrepreneurship, SMEs, Regions and Cities. The full conference agenda can be found here. Speakers can be found here. Details of the field visits, which showcase excellent examples of Scotland’s rural innovators, can be found here. A full list of OECD member countries can be found here. I wanted to be Tom Cruise, not a woman in agriculture!